Be Brave, Willa Bean! by Cecilia Galante. Book 2 in the Little Wings Series. 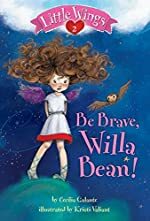 Review: The focus of Be Brave Willa Bean, which is written by Cecilia Galante, is Willa Bean has to be brave just as the title says. Wait, before I start, Willa Bean is a Cupid. Her friend, Harper, tries to persuade Willa Bean to fly. She has to fly up high where she has never been before. It is dark and Willa Bean is scared! Will she be able to accomplish these fear factors? Be brave Willa Bean is about Willa Bean having to fly to a far away place to help her sister. This is foremost problem for Willa Bean. She is in the middle of a sleepover with her best friend, Harper. Willa Bean, only having attended one sleepover, doesn't know what to do during that night. When her friends go out with Willa Bean's sister, she steals a golden arrow from her dad. She accidently drops the arrow when her wings go crazy, and she falls down onto a cloud. This is when Willa Bean has to get the golden arrow, and she panics because no one besides her parents is allowed to grasp the golden arrows. Be Brave Willa Bean is a good book for children under the age of 10. Willa Bean is a series character and readers will enjoy watching her tackle one adventure after the next. I can imagine younger readers rushing to get every book about Willa Bean. She is a cute, smart, and fun character that will appeal to early readers. Plus, the plot is ideal for younger readers as well. Overall, Be Brave Willa Bean is an excellent addition to a child's book shelf. We would like to thank Random House for providing a copy of Be Brave, Willa Bean! for this review. Have you read Be Brave, Willa Bean!? How would you rate it?